Cleansing is the first and most important step of any skincare routine and one that needs to be done properly. 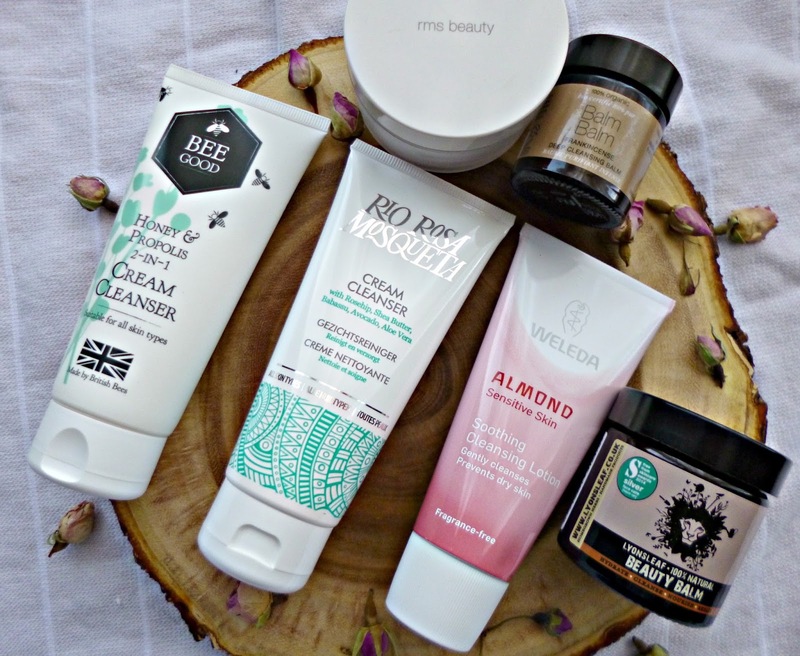 One of the questions I get asked the most is to give options for budget friendly cleansers that are natural but that still perform well, so I thought I would round up some of my favourites! I have tried to cater for all skin types here with balm, cream and gel/foaming textures. Obviously I haven’t been testing all of these at once, this is based on years of using natural and organic products and many of these I have been bought more than once. Weleda Almond cleansing lotion – (£9.95 for 75 ml) This cream cleanser is my go to for a gentle cleanse. Perfect for anyone with sensitive and temperamental skin, it is non-stripping and light so you have the option of removing with a cloth or rinsing off. It also works well with cotton wool to remove makeup. One of my most repurchased products for a reason, Weleda have such great ethics and green credentials too. The packaging is a recyclable metal tube so great for a zero waste lifestyle or if you are trying to use less plastic. Balm Balm Frankincense cleansing balm – (£9 for 30 ml) This is a traditional cleansing balm, particularly good for the cold weather. You will need a cloth to remove this, either a muslin or cotton flannel. The ingredients are simple, Shea butter, sunflower oil, beeswax, jojoba and grapefruit and frankincense essential oils and it allows you really massage the skin well. I love the deep scent of this balm, would highly recommend for dry skins. Moa the Green balm – (£12.50 for 50 ml) Another classic cleansing balm that won’t break the bank. With a coconut oil and soybean oil base, it also contains almond oil and the key ingredient to the line the plant yarrow. This removes make up and cleanses the skin, it doesn’t emulsify so you do need a cloth to remove but I like the addition of tea tree as can help keep break outs at bay. Lyonsleaf beauty balm – (£12.95 for 55 ml) Lyonsleaf is one of my all time favourite budget friendly lines. This gorgeous little pot is all natural, vegan and packed full of beautiful ingredients. Babassu oil, Shea Butter, Macadamia and sweet almond oils soften the skin and breakdown make up. This cleanser and moisturiser gets great reviews from bloggers with combination and oily skin too as babassu is great for rebalancing the skin. Bee Good honey and propoplis cleanser – (£11.50 for 100 ml) Bee Good is a brand who’s products are packed with ingredients such as honey, beeswax and propoplis. This cleanser is thick and creamy and rinses away easily from the skin. I like this a morning cleanser in the winter but it is a great all rounder and it tackles make up too. I like the fresh scent and it gives a beautiful glow thanks to the propoplis in the formula. Rio Rosa Mosqueta cream cleanser – (£8.95 for 100 ml) This cleanser from Rio is very impressive both in terms of ingredients and performance given it’s modest price point, in fact it’s one of my favourites. Shea Butter, babassu oil and avocado hydrate whilst leaving the skin clean and fresh. Can be used with a cloth or rinsed away. Versatile and gentle, this is one I happily include in my daily routine. RMS coconut cream – (£12.50 for 70 grams) Another multi-purpose product from the high end line RMS. This is a beautiful and very simple cleanser, make up remover and moisturiser with just one ingredient, pure unrefined organic coconut oil. The quality of this coconut oil is evident when you use it, it feels much lighter than food grade coconut oil and it is perfect for those with sensitive and reactive skin due to the fact that it has just one high quality ingredient. I apply to dry skin and remove with a warm organic flannel, it melts off all make up and leaves skin really soft. Organic Surge refreshing face wash – (£6.95 for 200 ml) If you love a face wash that has a light foaming action then this one from Organic surge is one of my favourites. Not only is this bottle great value for money but it feels really refreshing and not too stripping. The cleansing agents are gentler than some of the SLS based washes you usually find on the high street so it is a great one for teenagers just start out in skincare too. All these cleansers are available at Love Lula with free International shipping over £10.